I still don’t know what I’m wearing tonight! Or tomorrow! Probably same as you and will also just deal. The communication about the dress code and this NYE event hasn’t been too clear. 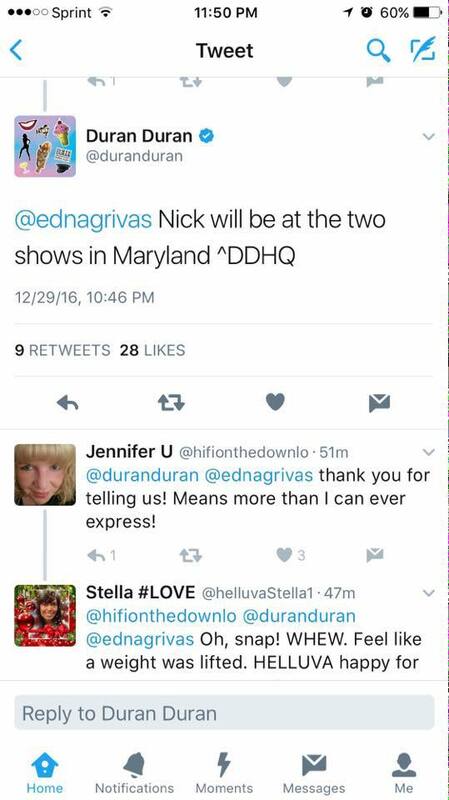 I’m also holding my breath until I actually see Nick there myself. I was glad see the tweet but I’m just worried. Yes, I mentioned the MTV performance in 1982 in the blog. I was wondering if they have ever done a regular concert. I’m only going to tomorrow’s show. I didn’t get the “semi formal” email, just the one about the gym clothes. I’m planning on nice jeans too. Guess I’ll throw something dressier in the car, just in case. I will look for you at the bar. I’ll probably be there WAY too early anyway.